The woodland crayfish occurs only in Missouri, especially in the Black River and its tributaries. The woodland crayfish is a stout, reddish-tan to dark brown crayfish with numerous blackish specks and blotches on the pincers, carapace, and abdomen. A narrow, crescent-shaped dark band extends across the rear margin of the carapace and onto the first abdominal segment. The first abdominal segment is usually flanked by a pair of small whitish spots. The woodland crayfish is easily distinguished from other similar species within its range by its brown coloration and blotched and speckled color pattern. It somewhat resembles the Ozark crayfish, but the two species do not occur in the same river basins (except for the introduced populations). Occurs in streams of all sizes, from the smallest headwater creeks to the largest Ozark rivers, but it is most abundant in creeks and small rivers. It seems to require permanent flow, silt-free, rocky and gravelly substrates, and low turbidity. This crayfish occupies cavities it digs beneath rocks and boulders, in riffles, in runs, and in silt-free rocky or gravelly pools. The most abundant and generally distributed crayfish in the Black River and its tributaries. It occurs sparingly in the headwaters of Big River. It has been introduced into several streams (such as Stouts Creek and Carver Creek) in Iron and Madison counties. 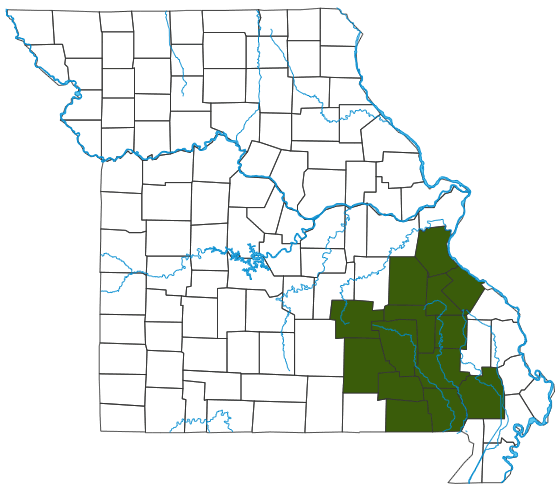 The woodland crayfish occurs only in Missouri. The life history is similar to that of other Ozark stream crayfish. It breeds in late fall and early winter, and females release eggs in the spring. Females carry the eggs beneath their abdomens. By early May, the eggs have hatched and the females are carrying young. Females are secretive while carrying eggs and young and are rarely seen. Most woodland crayfish do not live much beyond their third summer.